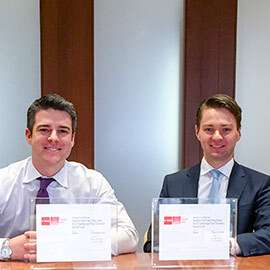 Greg Dean (BBA ‘08) and Stephen Groff (BBA ‘07) of Cambridge Global Asset Management were recently announced as co-winners of the Morningstar Breakout Fund Manager of the Year award. The Morningstar Awards honour excellence in the Canadian investment fund industry. They are given by Morningstar Research, Inc., a leading provider of independent investment research. Breakout Fund Manager of the Year is a new award category developed by Morningstar to recognize "up-and-coming managers worthy of investors' attention." Mr. Dean and Mr. Groff are Principals and Portfolio Managers with Cambridge, a division of CI Investments Inc. ("CI"). In a news release, Derek J. Green, CI President, was quoted: "Greg and Stephen have made significant contributions to the success and performance of the Cambridge funds since joining as analysts in 2011. They have earned their place among the leaders of the team and, as this award shows, are leaders in the industry as well." The complete news release can be found on the Morningstar website.